Yesterday's Chenpeng fall 2019 show was full of wonders: brightly colored ski suits that screamed for '80s James Spader, patchworked faux-fur coats with the widest collars, a sequined down jacket. But the real attention getters were scarves finished in the shape of giant hands. They looked like they were waving. Or offering a high-five. 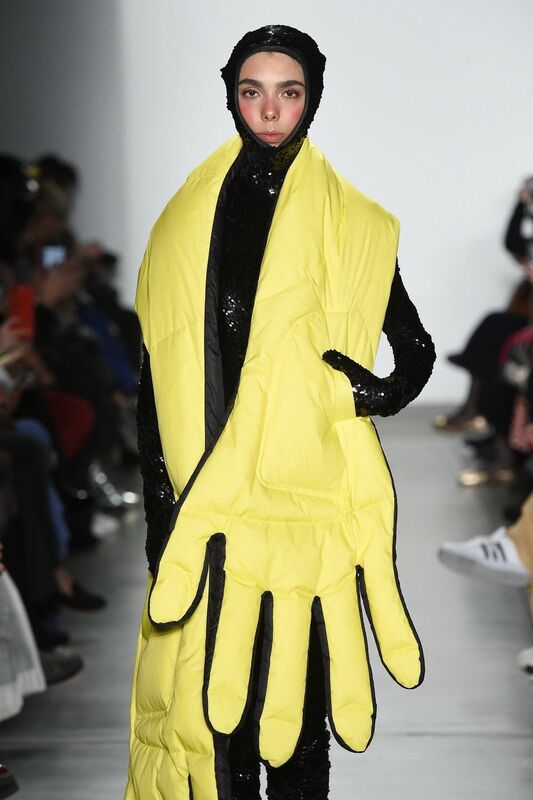 While the effect was one of joyous absurdity, designer Peng Chen approached the hands from a place of deep intention. According to show notes, the multi-handed scarf represented the Hada, a long Tibetan scarf presented in a gesture of respect. The design of Chen's palms "pays tribute to the guests coming from afar." What a lovely concept.